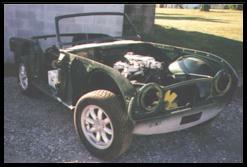 From the day that I purchased the TR4A, the intent was to do a full frame-off restoration. 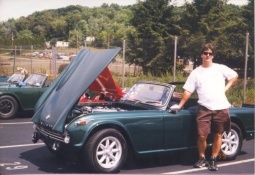 I had no idea what I was getting myself into since I had never worked on a Triumph. 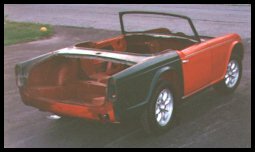 In fact, I did not even inspect the TR4A, other than to drive it and acknowledge that the car would require a complete rebuild. I basically felt that I would strip the car down to the frame and replace whatever parts needed to be replaced to restore the car 100%. I also had the ridiculous notion that I could do a full frame-off restoration on the car for around $5,000. Using the TRF, MOSS and Victoria British catalogs, I added up all the parts that were required and this was the figure that I came up with. Needless to say, this figure is not even 1/2 of what was eventually required. After I purchased the car, it was driven the 65 miles from Washington, DC to my Pennsylvania home and parted in the garage. I drove the car a few times around the block and in the alley and then started stripping the car down. I started with the interior. This was the worse part of the car from a cosmetic standpoint. The beautiful wooden dash had been recovered with wood grain contact paper by some DPO and this had faded and peeled into an ugly mess. As I removed each component, I carefully placed the hardware in a numbered zip lock bag and I used a notebook to record the removal process and any special notes, wiring diagrams, etc. Without this written log, the rebuilding process would have been much more difficult eight long years later. As the parts were removed, there were few surprises, other than the amount of rust in the car. As you can see from the pictures, the car did not look too bad (from a distance). 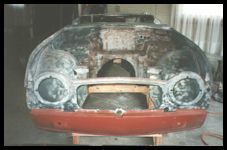 The outer body panels had some small rust bubbles, but there were no large holes. As I removed the interior, the true state of the car was to become evident. The car had severe rust and as I inventoried the parts required it was evident that I was in over my head. 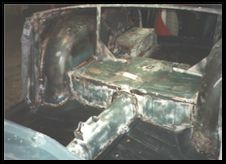 The car would need new floor pans on both sides, new rockers (both inner and outer). It also needed a bulkhead panel on the passenger side as this had accident damage to the rocker and this panel. The DPO had replaced the front fender, but had not properly repaired the underlying panels. This was to come back and haunt me 8 years later as you will see. The DPO had also "repaired" the drivers side floor pan with a 35-MPH Speed Limit sign. Once the interior was removed and labeled, I could start on the body panels. All of these removed quickly and easily, although I found out that three of the fenders were too rusty to reuse. The costs were beginning to go up. This page will be updated as the car starts for the first time in eight years and takes to the road again. I am excited and nervous as I have yet to drive a TR4A with these performance modifications. The car looks racy and like nothing else on the road. 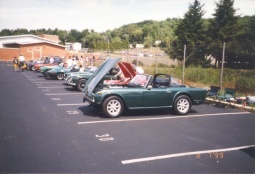 December 1998 update The TR4A is very close to completion. Basically the final carpet, and windshield remain to be installed. The engine is almost running (three cylinders) and I'll have to recheck the timing to get it fully running. One thing that does not appear in these photos is a surrey top. At the Summer Party this past year, we found a vendor selling a surrey top complete with frame, back glass, and the aluminum hard top panel. I had the back frame painted to match the car, and ordered all the components for the top. One by one, they arrived from TRF and the assembly began. The car now sports this new top and it adds to the racy look. The actual surrey top arrived here in early December (a Christmas present to myself!) and now the car is almost complete. After breaking the second windshield, I have now decided to take the windshield frame to a glass shop to install the windshield. The funny thing (if any of this can be funny) is that I installed the windshield in the Stag without any problems and the back glass in the hard top. You would think that the hard top back glass would be the real problem with the complex curves. 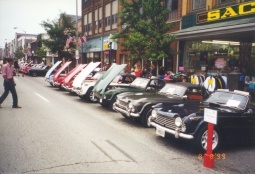 The TR4A only needs a few weekends of final prep. and it will be hitting the road some time in January or February (depending upon the weather). After ten long years, this project is finally about to be enjoyed! Yes and no. I made some very stupid mistakes in the original purchase and was very lucky to have had basically a solid car under the rusty body. 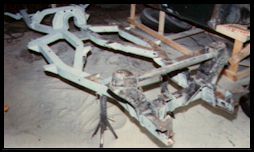 With the condition of the body shell, it is absolutely amazing that the frame was in excellent condition. I attribute this to the fact that the car is a solid axle TR4A. 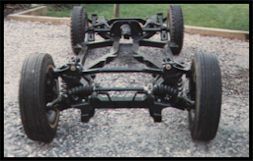 These models do not suffer the frame rot that infects the TR4-6 models with the IRS suspension. If I were to do another frame off restoration, I would start with a much more solid car (as I did with the Stag). You get what you pay for (at least you hope you do). A $1,000 car is probably only worth that and it will cost thousands to make the car like new again. At least I know what I have and that everything has been taken care of. I guess with a car that is not as rusty, you would always worry about what is lurking behind the old rocker panels. I know that rust free California and Arizona cars are available, and I would seriously investigate these if I did a car in the future. The TR4A as it was meant to be used. The view out the windshield was taken by my wife as we drove to the TRF Summer Party in August of 1999. The car performed 100% as I drove it to work in May and June to break it in and to enjoy it. I ended up putting over 5,000 miles on the car during the summer of 1999. The only problem in 5,000 miles of driving was a bad universal joint that started getting loud. The drive shaft had been rebuilt, so it was either installation error or a bad joint. 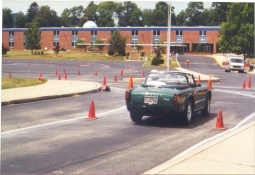 At the Summer Party, the TR4A was used by myself and my friend Jim Keenan at the Autocross. Our best time was a 36.070 which was not too bad considering this was the first time out. I will be installing an anti-sway bar in the front as a future modification. With the sticky tires, the car really handles well for such an old car. 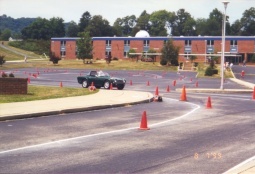 The autocross was a very tight course which favored the tight steering and the torque of the modified TR4 engine. One thing that I really messed up on was in not installing an overdrive transmission. The gearing is such that an overdrive gear is really necessary on the highway as the car quickly runs out of revs. It will pull strongly in all four gears up to about 90 MPH where it is running around 5,500 RPM. With the high compression head, it needs high octane gas and it likes the Sunoco 94 octane best. It will run fine on regular 93 with some octane booster added. I installed a stock compression head during the initial setup and break-in to see how it performed, but missed the crispness and the car felt like it had lost 10 HP. It really runs great with all the engine modifications. The only thing that I would consider doing in addition to the current modifications would be to either install a set of 2" SU carbs or Weber DCOEs or fit the low compression head and try to find an old Judson Supercharger. 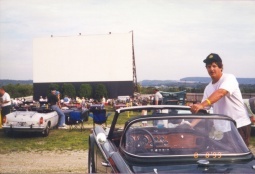 We all had a great time at the 1999 Summer Party and I'm trying to come up with a cool place to take my wife to compensate for all the years she's been by my side at these car events. Any suggestions? 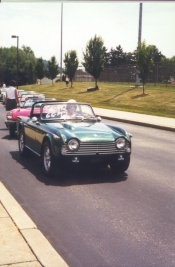 I will stick with the TR4A as I like it more as a driver's car. The Stag is in it's prime on the open highway and as a long distance cruiser it is hard to beat. The new Surrey top was definitely a good idea. Erecting the soft top only takes a few minutes and it is dry and warm. With the top off, the car is pretty calm and the back glass is so big and open that you never feel like you are not in a convertible. Definitely a good idea if you can find one. The TR4A was well worth all the effort and hard work. 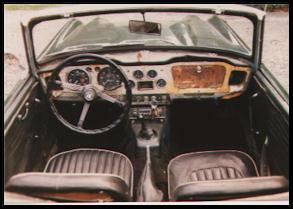 It is a rare car and finding one in this condition is very difficult. It is one of the most fun cars I have owned and on a back road or even just going to the local store is an adventure. I suspect that this car is one that I will be keeping for the rest of my life. Too much blood, sweat and tears and too much history to part with it. If this helps other TR owners to complete their projects, then this web site was worth the effort!